In the boom times of the late 1920s, the Douglas Aircraft Company of Santa Monica, California began designing a luxury "air yacht" seaplane for the wealthy. Unfortunately for Douglas, the aircraft was not completed until the summer of 1930 by which time the stock market had crashed and the country was entering The Great Depression. The Sinbad, as the seaplane was named, was a twin-engined, high-wing monoplane of wood and metal construction that could accommodate two pilots and eight passengers. The wing had two spruce box spars and was covered with plywood; a fixed float was mounted on the undersurface of each wing. The fuselage, or hull, was all metal with two steps; the vertical and horizontal tail surfaces were also metal. The control surfaces, i.e., ailerons, rudder and elevators, were metal framed and covered with fabric. The engines, which drove a two-bladed propeller, were mounted on top of the wing on struts with a small airfoil between the engine nacelles. Lastly, two small vertical fins were mounted on the upper horizontal tail surfaces. Only one Sinbad was built and it was sold to the U.S. Coast Guard (USCG) and designated RD; note the nonstandard USCG aircraft designation. While the Sinbad was being tested, Douglas began planning for an amphibious version intended for the military and civil markets to be named Dolphin. The Dolphin had a retractable landing gear; the main gear was attached to the fuselage by hinged V struts and to the wing undersurface by an oleo leg. The main landing gear was retracted by shortening the oleo legs which lifted the wheels above the waterline; the wheels did not retract into the fuselage or wing but lay about 45 degrees from the vertical position. The tail wheel also retracted upward. A total of 58 Dolphins were manufactured with the U.S. military purchasing 45 of them. The U.S. Army Air Corps (USAAC) purchased 24 aircraft; eight Y1C-21's redesignated OA-3 in 1933; two Y1C-26's redesignated OA-4 in 1934; eight Y1C-26As redesignated OA-4A in 1934; four C-26s redesignated OA-4Bs in 1934; and two C-29's. The U.S. Navy (USN) purchased nine aircraft, three RD-2's and six RD-3's, that were used by both the Navy and the U.S. Marine Corps (USMC); and the USCG purchased twelve aircraft, one RD-1, one RD-2 and ten RD-4's. The major difference between all of these models was the engines and the interior appointments. RD: The Sinbad made its first flight in July 1930 and was purchased by the USCG in February 1931. The aircraft was powered by two 300 hp (227.3 kW) Wright J-5C Whirlwind nine-cylinder, single row, air-cooled radial engines. RD-1: One aircraft for the USCG powered by two 435 hp (324.4 kW) Wright R-975E nine-cylinder, single row, air-cooled radial engines and equipped with military instrumentation and equipment. Accepted by the USCG in August 1932. RD-2: Four aircraft, three for the USN and one for the USCG. The USCG aircraft were powered by two 500 hp (372.8 kW) Pratt & Whitney R-1340-10 nine-cylinder, single row, air-cooled radial engines. The three USN aircraft were intended to be used by important Naval and Marine Corps officers and were powered by different engines. The first RD-2 was a VIP barge and was initially powered by two 410 hp (305.7 kW) Pratt & Whitney R-1340-1 engines but these were later replaced by the 500 hp (372.8 kW) R-1340-10 engines used on the USCG version. The other two RD-2's were less extravagant and were powered by two 450 hp (335.6 kW) Pratt & Whitney R-1340-96 engines. The USCG aircraft was delivered in July 1932 and the first USN aircraft was delivered in June 1933. RD-3: Six aircraft for the USN. These aircraft were a utility transport version of the RD-2 and were powered by two 450 hp (335.6 kW) Pratt & Whitney R-1340-4 or -96 nine-cylinder, single row, air-cooled radial engines. These aircraft were delivered in 1934-35. RD-4: Ten aircraft for the USCG. They were similar to the RD-3 but had increased fuel capacity and were powered by two 420 hp (313.2 kW) Pratt & Whitney R-1340-CI nine-cylinder, single row, air-cooled radial engines. These aircraft were delivered between November 1934 and April 1935. The USN acquired nine Dolphins, three RD-2's and six RD-3's. The first RD-2 delivered, manufacturers serial number (msn) 1138, had luxurious accommodations for five passengers and was placed at the disposal of President Franklin D. Roosevelt although he never used it. The aircraft was accepted by the Navy on 6 June 1933 and remained in service until being transferred to the National Advisory Committee for Aeronautics (NACA) on 4 December 1939. The two other RD-2's were intended for use by senior Naval and Marine officers and served at Naval Air Station (NAS) Anacostia, District of Columbia; NAS Coco Solo, Canal Zone; and with Utility Squadron ONE (VJ-1). The RD-3's served with VJ-1 and VJ-2 and at NAS Coco Solo; NAS Pearl Harbor, Territory of Hawaii; and NAS Norfolk, Virginia. In December 1941, two RD-3's were still in use at NAS Coco Solo and NAS Pearl Harbor. One RD-3 was transferred to the USMC and was assigned to Marine Utility Squadron SIX (VMJ-6M) at Marine Corps Air Station (MCAS) Quantico, Virginia in 1935. By February 1936, this aircraft had been transferred to VO-9M [redesignated Marine Scouting Squadron THREE (VMS-3) on 1 July 1937] at Marine Corps Air Facility (MCAF), Bourne Field, St. Thomas, Virgin Islands where it remained until 1939. 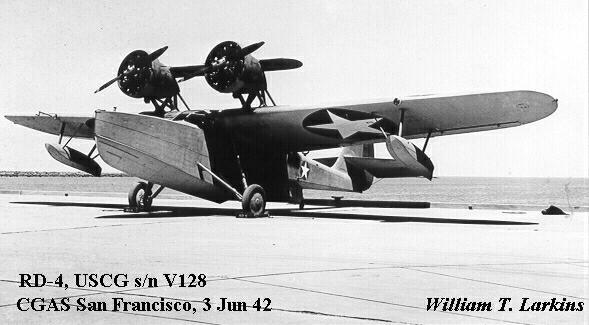 In 1936, two RD-2's had been transferred to the Marines; one was assigned to VMS-3 and the second remained at MCAS Quantico as a spare for VMS-3. By January 1939, only one RD-2 was on the inventory assigned to VMJ-1 at MCAS Quantico and this aircraft was stricken by March 1940. The USCG was the largest user of these aircraft. Prior to the U.S. entry into World War II, the USCG was under the jurisdiction of the Department of the Treasury and from the beginning of Coast Guard aviation, had been tasked with search and rescue (SAR) missions. In the late 1920's, the USCG developed the concept of the "flying lifeboats", i.e., aircraft that could fly out to a ship, land and then take a sick or injured passenger or crew member back to shore. This was the original reason the first RD was purchased. The RD was commissioned on 9 March 1931 followed by the RD-1 which was commissioned on 5 August 1932; both were decommissioned in November 1939. The RD-2 was commissioned in July 1932 and served as the administrative aircraft for the Secretary of the Treasury until it crashed in March 1937. The ten RD-4's were commissioned in November 1934 (1), February 1935 (4), March 1935 (2) and April 1935 (3). One of these aircraft crashed in August 1935. On 1 November 1941, the USCG was transferred to the jurisdiction of the USN and the four remaining RD-4's were assigned to security patrols along the U.S. seaboard. The last RD-4 was decommissioned in June 1943.